Summary: This live video hangout gave readers of my LinkMoses Private newsletter the opprtunity to ask any questions they wanted to about links, linking strategies, link development, online public relations, and many other topics linking related topics. Originally scheduled to go 2 hours but delayed twice due to weather, the video ended up being 2 1/2 hours long with hundreds of live viewers. The recording of the live video is now free for anyone to view. I’ll try to do these live video sessions at least once a month, with each one focusing on a different topic. So far, the most requests I receive are for live real-time Q/A sessions, so for now, that’s what I’ll do. Attracting and earning attention, mentions, and links to your content (or your clients) is a deceptively difficult, subtle and vital skill. Outreach is a key part of the process, but quantifying a “success metric” that can be applied to any project, client, or vertical is tough to pin down. Why? This Hangout will cover many outreach related topics, and is open to anyone who wants to join in and listen. I’ll stay on the air for two hours, talk about outreach approaches, successes, and failures over 20+ years of outreach, and take your questions, because I’m a glutton for punishment. Link builders Eric Ward and Garrett French, and Site Usability Expert, Shari Thurow, joined forces to live brainstorm ideas for four participant-submitted websites. If you want to see how an industry expert’s mind works in-action, this is the webinar to watch. In this video I discuss the concept of “earned links” and how they differ from the types of links that Google ignores and/or penalizes. The biggest challenge when link building is recognizing and knowing how to increase earned links. Earned links, much like earned media, is and will remain the gold standard for algorithmic analysis of backlinks. Eric Ward explains this fundamental issue for anyone doing a quality link building campaign. Eric offers workshops and consulting on this and many other linking strategies. This is the edited version of a two hour linking strategy Q/A, where I answered linking related questions in real-time, screen shared real-life scenarios and examples by request, and discussed some of my recent client linking work. I’ve been a linking strategist for 20 years, and since I can be on the speaking circuit like I was previously at over 160 conferences, these live video Q/As are the best way for me to connect right now. Hopefully once my three kids are a little older I’ll get back out on the conference road again. Until then, I hope you find these videos helpful. What is LinkMoses Private? LinkMoses Private is a private subscription-based newsletter filled with linking strategies, Q/A, client linking case studies, news and high quality natural Link Opportunity Alerts, delivered straight to your inbox at least monthly. Now with subscribers in 20 countries. ViralHeat sits down with link building expert, Eric Ward to pick his brain about Penguin 2.0, social media, and the history and evolution of online marketing. In this webcast, link-building expert Eric Ward and AdGooroo CEO Richard Stokes will provide an unprecedented look inside the “black box” of the search engines to 1) reveal the formulas being used to determine quality links from spam and 2) debunk the myths surrounding page rank, keyword density, title length, anchor text, word length, high value advertising terms and more. WebProNews’ Mike McDonald and I discuss how link building has changed in the past ten years or so, and the implications for today’s link builders. 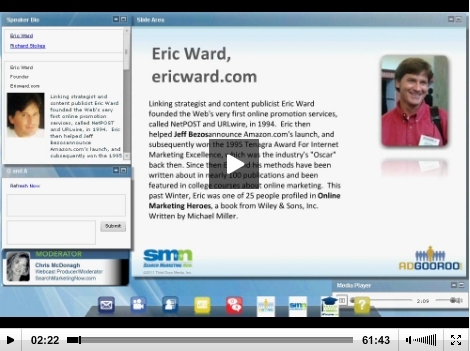 Join Eric Ward in link building video module covering link building fundamentals. This is taken from his private white hat Link Building training class.